It was an action packed penultimate day of the 2019 National Under 19 Female Championships with ACT/NSW Country and NSW Metro booking their spots in the One Day final following undefeated campaigns. Despite the strong performances of both New South Wales sides, it would be Phoebe Litchfield and Annabel Sutherland that stole the show on day seven, as the Cricket Australia XI and Victoria Metro batter became the first players to hit a century in the 2019 championships. Batting first against Victoria Country, the CA XI were brilliant from the beginning as opener Ruth Johnston (31) and Litchfield built the platform for a strong first innings score with a partnership of 66 for the second wicket. 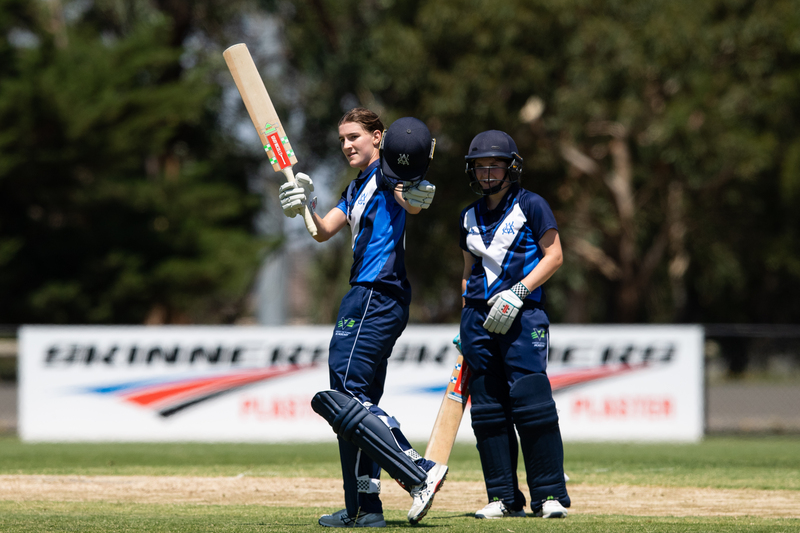 The middle overs would then turn into a display of complete class by Litchfield as she almost single handily carried the CA XI middle order and treated the Victoria Country bowling attack with dismay on her way to an incredible 104. Small contributions from Kate Peterson (18), Molly Healy (12) and Molly Godsell (11*) would also prove valuable as the CA XI plundered their way to a huge first innings score of 242 from 48 overs. Tiana Atkinson would provide some highlights for Victoria Country in the first innings, as she successfully managed to halt the CA XI onslaught and cash in with some middle order wickets to end up with impressive figures of 5-32. With an unlikely victory target of 245, Victoria Country would suffer a shaky start before a solid second wicket partnership between Merinda Hale (26) and Tahlia Meier (19) brought the chase back on track. It would take a brilliant spell by Jade Allen to again put the CA XI on top, with her figures of 4-22 taking the sting out of the Victoria Country chase. The CA XI would close the tail well, as a collapse of 5-36 gifted them a comprehensive 106 run win to remain undefeated in the 50 over format. Victoria Metro picked up their first win in the 50 over competition courtesy of a brilliant captain’s ton by Sutherland. In a battle of two of the competitions winless teams, Victoria Metro looked under pressure early with both openers departing early to have them at 2-16. With her side battling, Sutherland would produce a knock for the ages as she rebuilt the innings with some exquisite shot making and immense power. Jessica Matin would serve as an excellent foil for the skipper, as the crafty middle order batter helped make the Metro total a big win with a busy 42 off 53 at the back end. Sonia Yadav would be the only multiple wicket taker for Western Australia, with her impressive spell of 3-32 from eight overs somewhat stemming the flow of Metro runs. Faced with an improbable total of 225 for victory, it was a disastrous chase for Western Australia as after getting to 1-33 the middle order collapsed severely to have them reeling minutes later at 5-41. Erika Quinn would be the standout with ball in hand for Metro, as she tore through the Western Australian batting lineup with figures of 4-16 from 8.2 overs. Some late hitting by Georgie Ireland and Ashlee King would restore some respectability for the Western Australians as they were eventually bowled out for just 108, handing Victoria Metro a convincing 116 victory. NSW Metro remained undefeated in the 50 over competition with a comfortable seven wicket win over South Australia securing their spot in tomorrow’s final. Hannah Darlington continued her excellent tournament with the ball claiming exceptional figures of 3-23 as South Australia struggled with the class of the NSW Metro attack. Star batter Rachel Church would be the only South Australian to provide any resistance, with her 42* an innings of class and composure with no other teammates managing to register double digits. Isabella Malgiogio also continued her strong form with the ball, as she took 3-16 to clean up the tail and restrict South Australia to a lowly total of 81. With a small chase at hand, NSW Metro tackled the challenge positively with opener Hayley Silver-Holmes the standout performer hitting 43* off just 40 deliveries. It would be a nervy start however, as a fired up Darcie Brown (2-16) and Bella Smith (1-28) made early inroads to have NSW Metro reeling at 3-40 and in danger of a stunning middle order collapse. However, the arrival of all rounder Alise Genford to the crease would restore order in the Metro chase, as a class 17* saw her combine with Silver-Holmes for a partnership of 42 to see her side home within just 14 overs. ACT/NSW Country continued booked its place in tomorrow’s final with a crushing nine wicket win over Northern Territory at Ballarat Grammar. It was an impressive all round performance from the Country bowlers in the first innings, with multiple wickets to Lara Graham (3-26), Anika Learoyd (2-7) and Jessica Davidson (3-2) the catalysts to an incredible middle order collapse of 7-8. Monet Hunter would be the only Northern Territory batter to get going, with her 26 from 45 the only real resistance against the consistent bowling put forward by ACT/NSW Country. Chasing a lowly 79 for victory, it would be a nervous start for Country as star batter Sarah Young was dismissed cheaply for six to have them at 1-9 in the early stages. This would only give Anika Learoyd (31) and Alisha Bates (27) the perfect opportunity to shine, as the pair batted with fluency and positive intent to take any hope away from the overpowered Northern Territory bowlers. In a match winning partnership of 70, the pair would see ACT/NSW Country to a crucial big victory after just 14 overs as they looked to gain the necessary net run rate to see them into the final. Queensland produced an outstanding bowling performance at CE Brown Reserve, restricting Tasmania to just 58 in a crushing eight wicket victory. The entire Queensland attack was on song from the get go, with multiple wickets to Courtney Sippel (2-13), Kirsten Davey (2-13), Emily Vallance (2-4) and Neve Lynch (2-18) proving too strong for the Tasmanian batting lineup. With only one score above 10, the Tasmanian’s could never get going with their innings only lasting 22.2 overs. In response, it was a swift chase by the Queenslanders with positive intent from openers Emma Jackson (23) and Charli Knott (13) getting their side off to the perfect start. Two wickets in the dying stages of the match would do little to worry Queensland, as they managed to chase down the target of 59 in just ten overs to claim fourth position on the table.